The following form is designed to effect an assignment of an existing lease from the original tenant to a new tenant who will occupy the space after the satisfaction of certain conditions. The agreement also contains the consent of the landlord required under the lease for assignments. The new tenant is acquiring the furniture and personal property of the original tenant pursuant to a bill of sale which is an exhibit to the agreement. The landlord is to receive cash and warrants to acquire common stock in the original tenant as part of the deal. Exhibits Included: Bill of Sale and Warrant for Common Stock Purchase. This Amendment and Assignment of Lease, Release, and Assumption Agreement (the "Assignment"), is made as of _________________, by and between COMMERCIAL PROPERTY LANDLORD, INC., a __________________ corporation (“Landlord”), ORIGINAL TENANT, INC., a _________________ corporation (“Assignor”), and NEW TENANT, INC., a _________________ corporation (“Assignee”). A. Landlord, as landlord, and Assignor, as tenant, are parties to that certain lease, dated __________ (the "Lease"). A copy of the Lease is attached hereto as Exhibit "A." All capitalized terms not otherwise defined in this Assignment shall have the meanings set forth in the Lease. B. Under the terms of the Lease, Assignor has leased from Landlord that certain real property situated in the City of _____________, County of _____________, State of __________, as presently improved containing approximately ________________ (_____) square feet, commonly known as ______________, and more particularly described in the Lease (the "Premises"). C. Assignor desires to assign to Assignee all of Assignor's right, title, and interest in and to the Lease and the Premises, and Assignee desires to accept such assignment and to assume all of Assignor's duties and obligations under the Lease, on the terms and conditions set forth in this Assignment. D. In addition to assignment of the Lease, Assignor has agreed to sell, and Assignee has agreed to purchase, personal property owned by Assignor that is located in, on, or about the Property consisting of that equipment, furniture, laboratory improvements, fixtures and utility systems described in Exhibit. "B", which is attached hereto, and incorporated herein by reference (collectively the "Personal Property"). 1. The Closing Date; Conditions Precedent. 1.1 Closing Date. Subject to satisfaction of all of the Conditions Precedent (defined below), the transactions contemplated in this Assignment shall close within one business day of the later to occur of the following dates (the "Closing Date"): (i) the date that Assignor formally tenders possession of the Premises to Assignee; provided, however, that, if the Closing Date shall not have occurred on or before _________ (the "Outside Delivery Date"), then Assignee, in Assignee's sole election, may terminate this Assignment by providing written notice thereof to Assignor and Landlord within three (3) business days of the Outside Delivery Date; or (ii) _____________ with rent from Assignee starting no sooner than __________. If this Assignment shall be terminated by Assignee in accordance with this paragraph, then any rent or other consideration, together with any Security Deposit, previously delivered by any party to this Assignment to another in accordance with the terms of this Assignment shall be promptly refunded (or returned) to the delivering party. 2. Purchase of Personal Property. On the Closing Date and subject to satisfaction of the Conditions Precedent, Assignee shall pay to Assignor, cash, or equivalent, in the amount _______________________ dollars and no cents ($_________), in full payment for all of the Personal Property (the "Personal Property Consideration"). Simultaneous with delivery by Assignee of the Personal Property Consideration, Assignor shall deliver to Assignee a fully executed Bill of Sale for the Personal Property in substantially the form attached hereto as Exhibit "C" (the "Bill of Sale"). Assignee shall be responsible for, and shall indemnify and hold harmless Assignor against, all __________ sales taxes (if any) due as the result of the sale of the Personal Property. 3.2 Assignor shall issue to Landlord a warrant (the "Warrant") for _______ shares of common stock of Assignor in the form of "D" attached hereto. "LEASE EXPIRATION DATE:___________, unless earlier terminated by Landlord in accordance with the terms of this Lease." "USE: Office and Research and Development, including, without limitation, manufacturing, warehousing, and other related legal uses"
"in the same condition, broom clean, as existed at the Lease Commencement Date, reasonable wear and tear excepted." "in the same condition, broom clean, as existed on the Closing Date [as defined in this Assignment], reasonable wear and tear excepted." "to the extent such Improvement Work relates to non-specialized improvements or alterations shown on the plans and specifications approved by Landlord and having general utility to other users. However, to the extent the Improvement Work relates to specialized improvements installed on Tenant's behalf, such improvements shall remain on the Leased Premises upon expiration or prior termination of this Lease unless Landlord elects to require that Tenant at its sole cost remove such improvements, in which event Tenant shall remove such improvements and shall repair all damage caused by such removal. Landlord agrees upon specific written request by Tenant at the time Tenant shall submit its final improvement drawings for approval by Landlord to notify Tenant in writing which such Improvement Work Landlord will require Tenant to remove from the Premises upon expiration of the Lease Term pursuant to the foregoing"
"(i) Landlord may forward invoices or bills for such expenses to Tenant, and Tenant shall, not later than the last to occur of the following dates: (i) thirty (30) days following receipt by Tenant of the invoice; or (ii) ten (10) days prior to the due date for such invoice, pay such invoices or bills and deliver satisfactory evidence of such payment to Landlord, and/or"
"(ii) Landlord may bill to Tenant, on a periodic basis not more frequently than monthly, the amount of such expenses (or group of expenses) as paid or incurred by Landlord, and Tenant shall pay to Landlord the amount of such expenses by the last to occur of the following dates: (i) thirty (30) days following receipt by Tenant of the bill; or (ii) ten (10) days prior to the due date for payment by Landlord of the underlying invoice, and/or"
This thirty (30) days applies only to invoices and not to Base Monthly Rent or Additional Rent due the first of each month. "Tenant shall continuously and without interruption use the Leased Premises for such purpose for the entire Lease Term. Any discontinuance of such use for a period of sixty (60) consecutive calendar days shall be, at Landlord's election, a default by Tenant under the terms of this Lease. Landlord may elect upon request by Tenant to extend the period of any vacation of the Premises by Tenant, in Landlord's sole and absolute discretion, and in such event may require Tenant to provide reasonable security for the Premises." "Tenant shall use the Leased Premises for such purpose for the entire Lease Term. If, during the term of the Lease, Tenant shall vacate the Premises for a period in excess of sixty (60) consecutive calendar days, Landlord may require Tenant to provide reasonable security for the Premises." 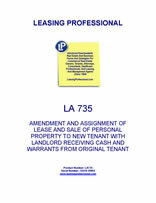 "all Laws and Private Restrictions respecting the use and occupancy of the Leased Premises,"
"all Laws and Private Restrictions respecting Tenant's particular use of the Leased Premises (as opposed to use and occupancy of the Leased Premises in general),"
"(b) Notwithstanding anything to the contrary in this Lease, Tenant, at its sole cost, shall comply with all Laws relating to the storage, use and disposal of Hazardous Materials; provided, however, that Tenant shall not be responsible for contamination of the Leased Premises by Hazardous Materials existing as of the date the Leased Premises are delivered to Tenant (whether before or after the Scheduled Delivery Date) unless caused by Tenant." "(b) Notwithstanding anything to the contrary in this Lease [as modified by this Assignment], Tenant, at its sole cost, shall comply with all Laws relating to the storage, use and disposal of Hazardous Materials; provided, however, that Tenant shall not be responsible for contamination of the Leased Premises by any Hazardous Materials existing in, on, or about, the Leased Premises, the Building, and/or the Property on the Closing Date [as defined in this Assignment]." 4.7 Ownership of Improvements. Schedule 6.2, as referenced in Paragraph 6.2 of the Lease (Ownership of Improvements) is amended to include all of the Personal Property [as defined in this Assignment]. "Tenant's particular use of the Leased Premises, the Building, the Outside Areas or the Property (as opposed to the general use or occupancy thereof)"
"including interest at a rate equal to the greater of (a) 12%, or"
"including interest at a rate equal to the lesser of (a) the maximum rate that may be charged by a non-exempt lender for a loan or forbearance of money, or"
"(b) in Landlord's reasonable judgment, the use of the Premises by the proposed assignee or sublessee would be for a purpose other than that permitted under this Lease, would entail any alterations which would lessen the value of the leasehold improvements in the Premises, or would require increased services by Landlord;"
"7.9 TRANSFER TO AFFILIATE. Notwithstanding anything to the contrary in this Lease [as amended by this Assignment]: (i) Tenant shall not be obligated to pay to Landlord any assignment consideration, excess rentals, or other consideration received by Tenant; (ii) Landlord shall have no right to recapture or retake possession of the Premises; (iii) no "option" or other right of Tenant hereunder shall terminate or otherwise be affected, and (iv) the consent of Landlord shall not be required, with respect to any proposed assignment or sublease of all or any portion of the Premises or this Lease to: (i) any corporation, limited liability company, partnership, or other legal entity which, directly or indirectly, owns or controls Tenant, is owned or controlled by Tenant, or is under common ownership or control with Tenant; (ii) any successor of Tenant by purchase, merger, consolidation or reorganization; (iii) any investor or lender or pays money or other consideration to Tenant in exchange for such party's ownership interest in the company (whether or not such investment would otherwise constitute a change of control as defined herein); or (iv) any vendor or contractor of Tenant for the purpose of completing work required by Tenant in the conduct and operation of Tenant's business (hereinafter, collectively, referred to as "Permitted Transfers"), provided: (a) Tenant is not in default under this Lease beyond applicable cure periods; (b) if such proposed transferee is a successor to Tenant by purchase, merger, consolidation or reorganization, the continuing or surviving entity shall own all or substantially all of the assets of Tenant and shall have a net worth which is at least equal to the greater of Tenant's net worth at the date of this Lease or Tenant's net worth at the date of the Transfer; (c) such proposed transferee operates the business in the Premises for the use described in this Lease and no other purpose; and (d) in no event shall any Transfer release or relieve Tenant from any of its obligations under this Lease. Tenant shall give Landlord written notice of any such Permitted Transfer." 5. Assignment of Lease and Premises. Subject to satisfaction of the Conditions Precedent, effective as of the Closing Date, Assignor hereby assigns to Assignee all of Assignor's right, title and interest, in and to the Lease and the Premises, including, without limitation, the Assignor's right to the quiet use and enjoyment of the Premises; and Assignee accepts such assignment.